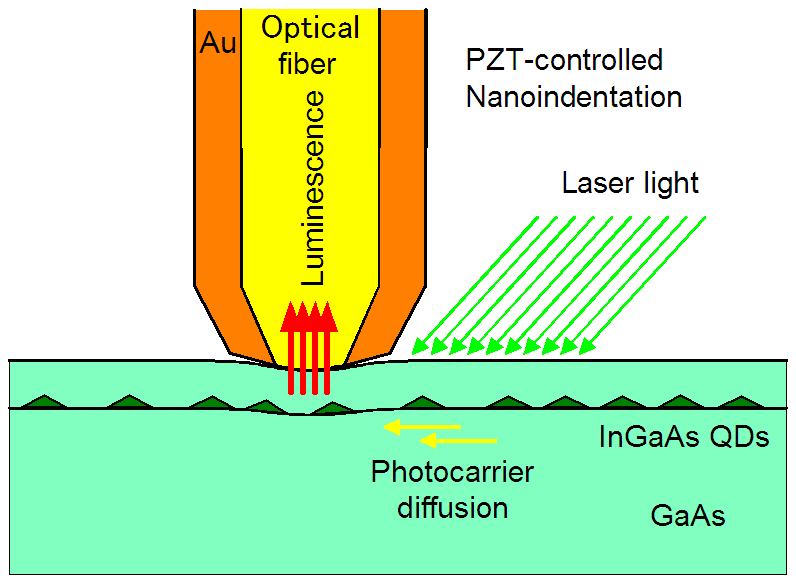 We found that the photoluminescence (PL) of InGaAs/GaAs quantum dots (QDs) was remarkably enhanced by the nano-indentation of the light-collecting fiber nanoprobe onto the sample surface. The mechanism of PL enhancement was analyzed through calculations of the nanoprobe-induced strain and the energy-band profiles in the bulk GaAs surrounding InGaAs QDs, on the bases of linear continuum elastic theory and six-band strain Hamiltonian. The calculations have revealed that the confinement potential for light holes was generated by the nanoprobe indentation at 50-70 nm beneath the nanoprobe. This work was of collaboration with prof. Arai at Saitama University. 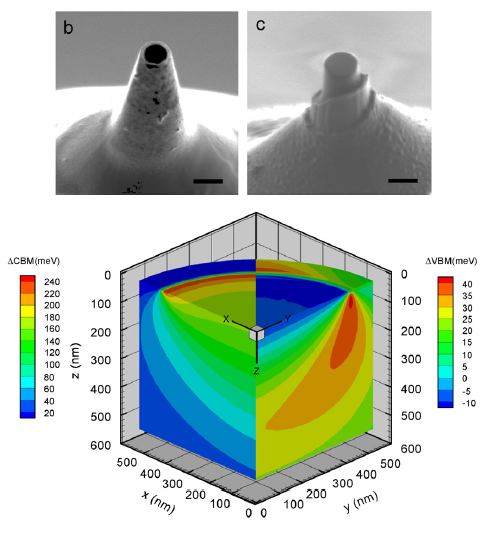 We also fabricated two other types of nanoprobe apex, i.e., a flat apex and dome-shape apex, with focused ion beam (FIB) technique. 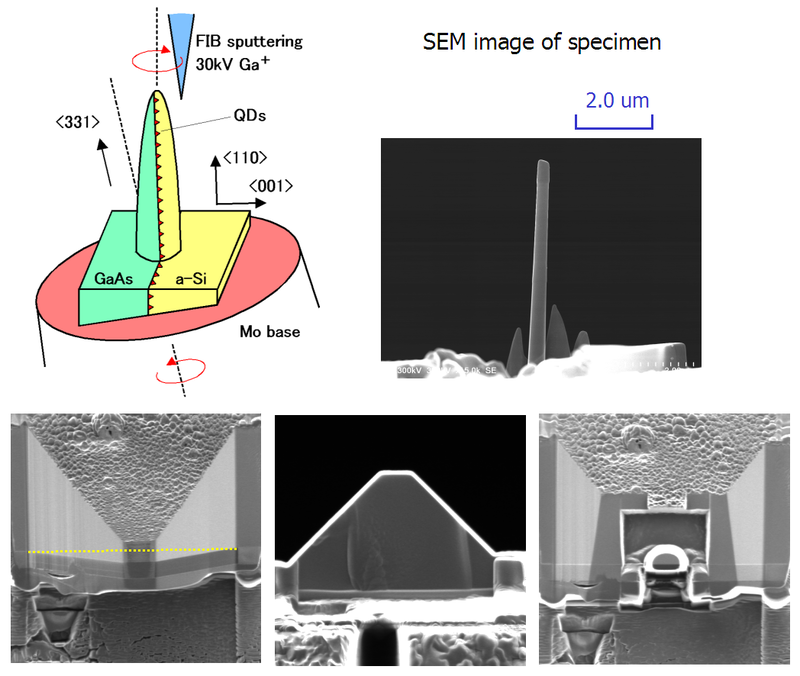 By introducing a high-sensitive load cell, the indentation force and PL of QDs were measured simultaneously at each point in the direction of the nanoprobe horizontal scanning with a constant indentation force. 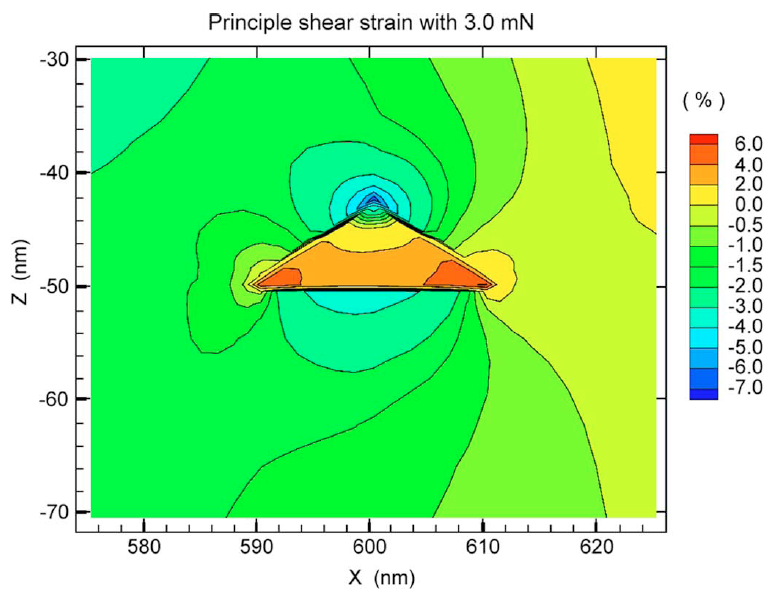 The strain and energy band calculation with a finite element method revealed that all the emission traces clearly observed were emitted from the QDs around the edge of the nanoprobe-indented area, which caused by hole accumulation around the contact edge of the indented nanoprobe due to high shear strain. 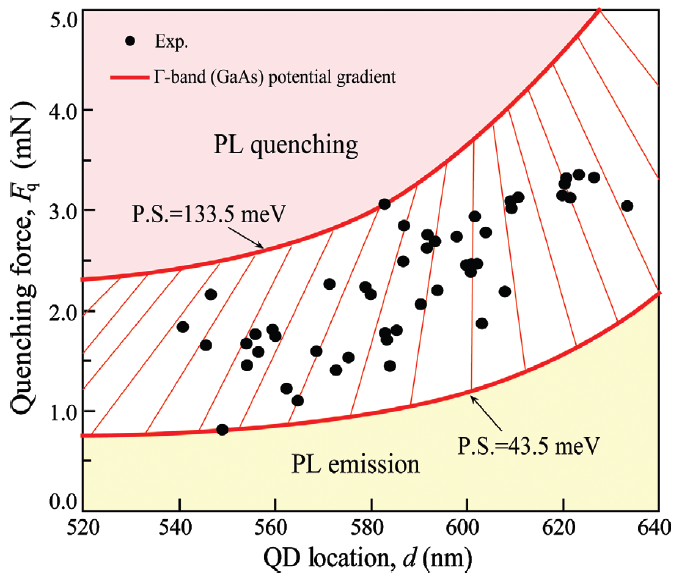 The location of QDs embedded in a GaAs matrix was successfully identified by nanoprobe indentation with a horizontal scan through PL spectrum change along the scan distance. When the indentation force increase, the intensity of the fine PL peaks increased by more than one order of magnitude and then decreased down to zero (quenched), while an almost constant blueshift was observed for each fine PL peak, ranging from 20 to 80 meV/mN. We investigated the mechanism of PL quenching from the viewpoint of direct-indirect transition and electron repulsion induced by the potential gradient in the GaAs matrix. Since the strain required for PL quenching was too small to induce direct-indirect transition, we concluded that the electron repulsion is the responsible mechanism for PL quenching. 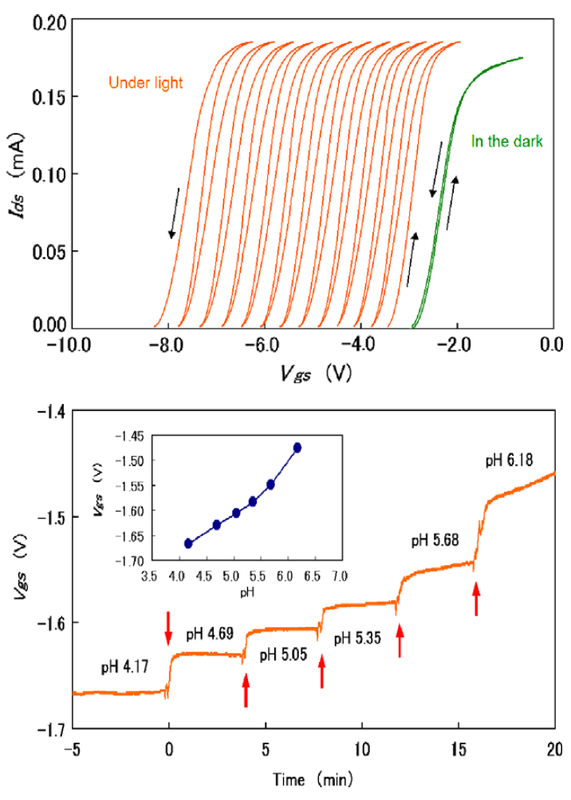 The indentation-induced shift of electron potential at quenching was deduced to be 43.5-133.5 meV. 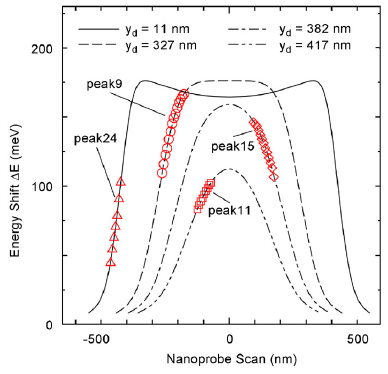 The large inhomogeneous hydrostatic strain induced around the nanoprobe edge plays an important role in the PL quenching through the electron-repulsion due to the potential gradient. 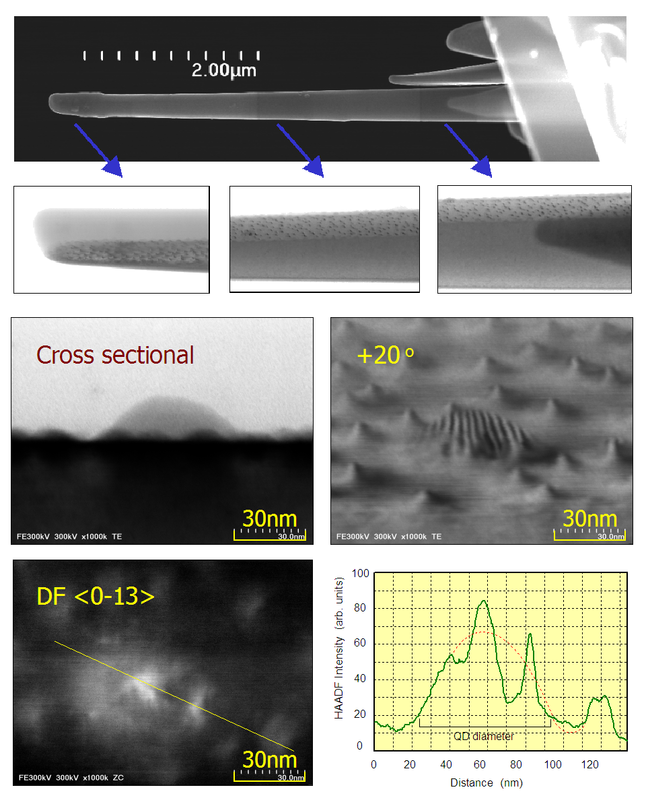 We developed mesa-cutting method to prepare a cylindrical TEM specimen by FIB processing. 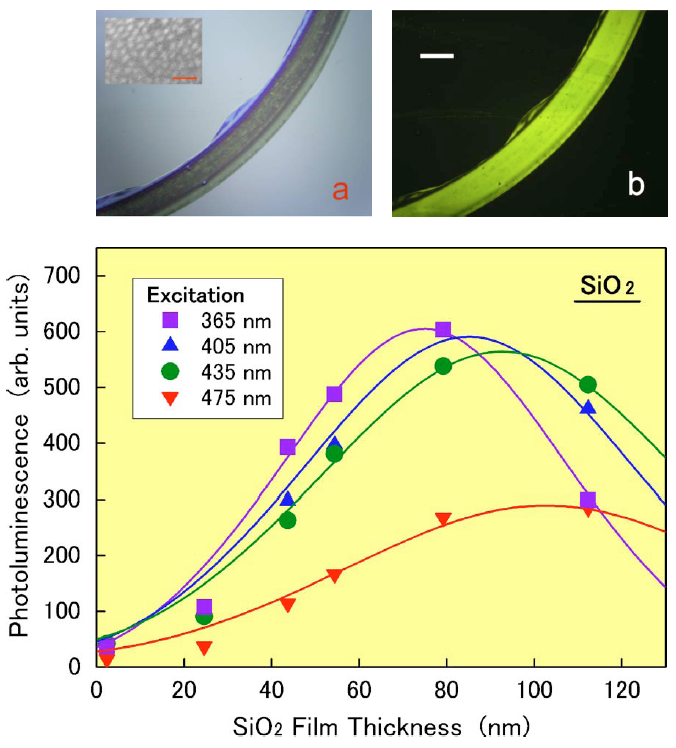 Multi-azimuth 360o observation of quantum dots including both cross-sectional and plan-view observations are performed on a single cylindrical STEM specimen. The key of mesa-cutting method is the position/axis alignment of QD interface to the center of rotational axis exactly. The fabricated cylindrical specimen contained the QD interface at its center axis of cylinder with 200-300 nm in diameter and 5 um in length. The 3D-STEM observation of QDs revealed that the QDs had facet structure of truncated pyramids reconstructed from facet-enhanced bright-field images newly observed with the incident axes slightly off from <-552> or <-332>, resulting in high contrast for the lattice distortion on (110) facets. Dark-field images for a large QD clearly indicate indium distribution inside the large QD, originating from the coalescence of two small QDs during growth. Localized relaxation of the lattices was observed, for the same large QD with indium content fluctuation, as disturbed/disappeared moire-fringes in the images taken with the incidence around <-552>. 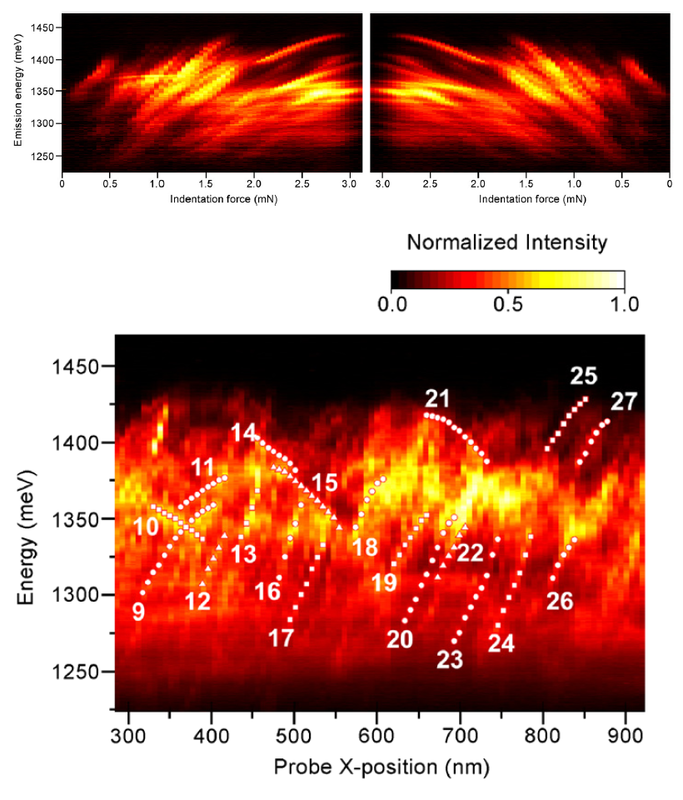 This work was of collaboration with Hitachi Co., Ltd.
(1) The PL intensity depends on the insulator thickness where the NPs are placed, due to interference effect for excitation wavelength. 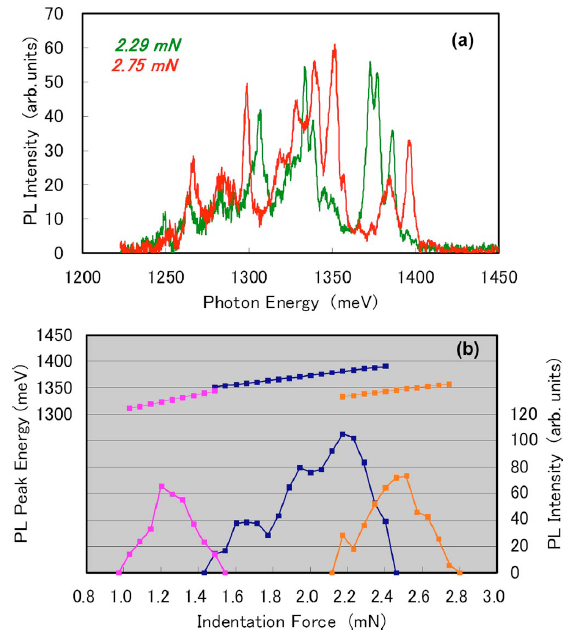 (2) The NPs on GaAsOx/GaAs or SiO2/Si exhibited PL decay and blueshifts on a time scale of minutes depending on the excitation wavelength, i.e., higher photon energy induces a faster PL decay with a larger and faster blueshift. 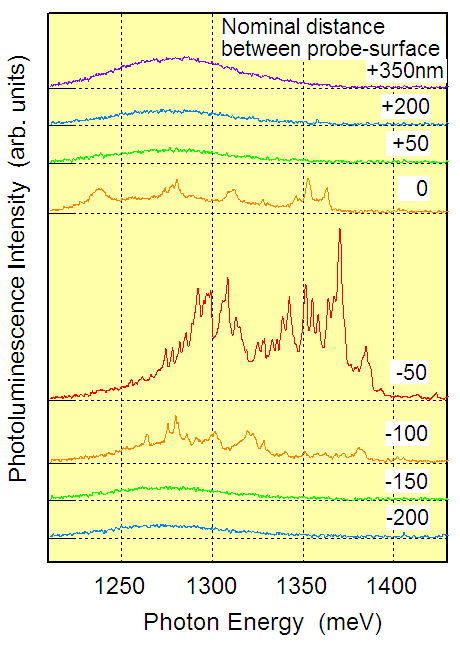 (3) The excitation-wavelength dependence of the blueshift was much larger than that of the PL decay. The blueshift is caused by photoinduced oxidation with atmospheric oxygen. 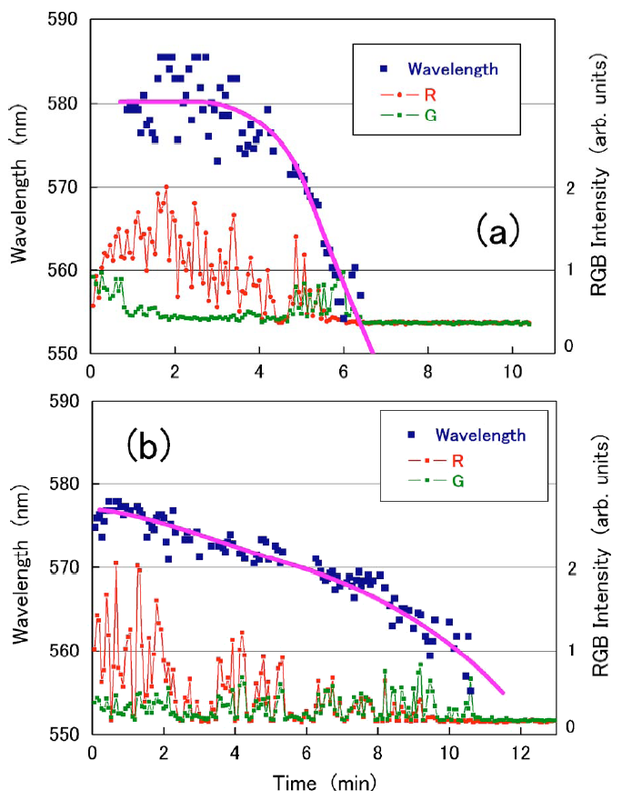 (4) Similar temporal PL evolutions were observed in single-NP measurements as gradual changes in colors. (5) The most probable mechanism for PL decay is the photoinduced extraction of surface-protecting molecules from the NPs, which induces nonradiative recombinations of photoexcited electron-hole pairs. 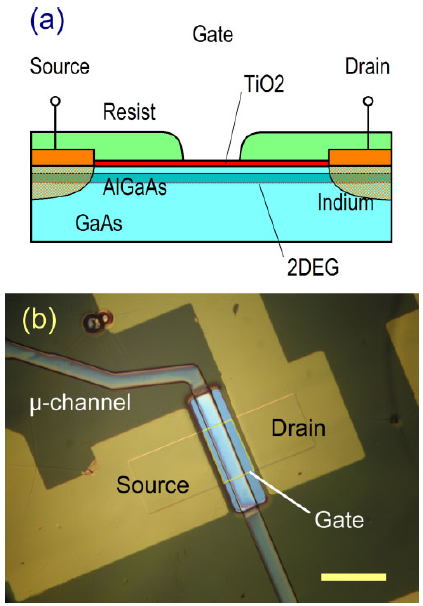 We investigated the surface, biocompatibility, and H2O2 sensitivity of TiO2 films of 13-15 nm in thickness prepared by sol-gel technique, from the viewpoints of aptitude for a gate-oxide film on two-dimensional electron-gas (2DEG) field-effect transistors (FETs) for cell-viability sensors. 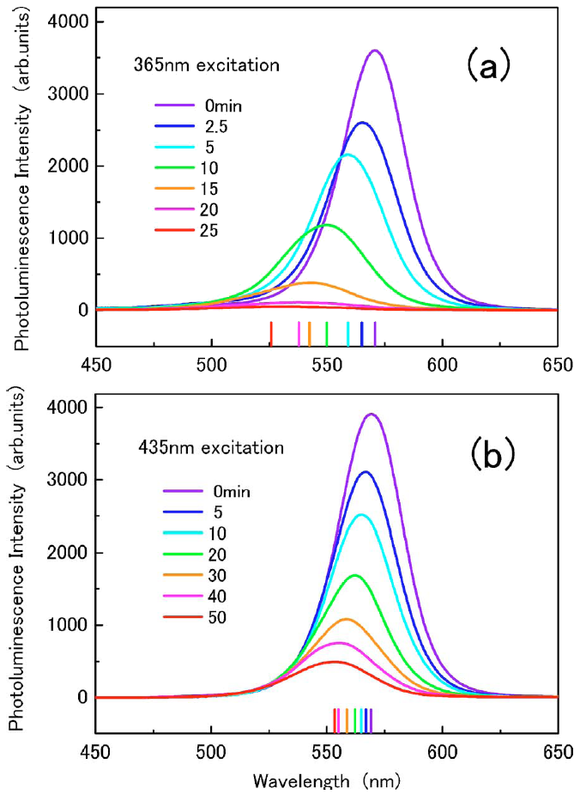 The surface of TiO2 thin films had nanometer-scale roughness (approximately 1 nm in height), but was uniform and flat in micrometer scale. Large and continuous threshold shifts to the negative side of Vgs are resulted when the TiO2/2DEG-FETs are operated under light at negative gate biases (Vgs < 0 V). This reveals that photoexcited holes are accumulated at the interface of TiO2/GaAs by the negative gate biases. The sensitivity for pH was 71 mV/pH. 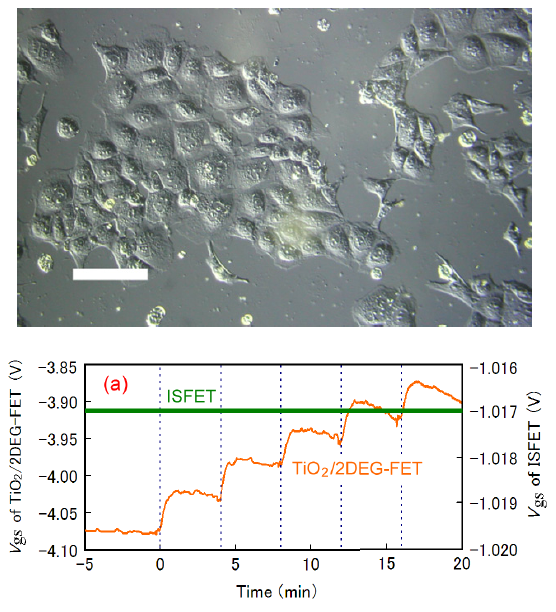 The TiO2 surfaces showed better biocompatibility than GaAs surfaces as demonstrated by direct T2 cell culture on the TiO2 surfaces without pretreatment by FN or collagen. TiO2/2DEG-FETs exhibit a high H2O2 sensitivity up to 4.5mV/uM, whereas conventional ISFET (Ta2O5/Si-FET) is insensitive to H2O2. The mechanism of H2O2 sensitivity is probably due to the chemical change of TiO2/GaAs interface evoked by H2O2.